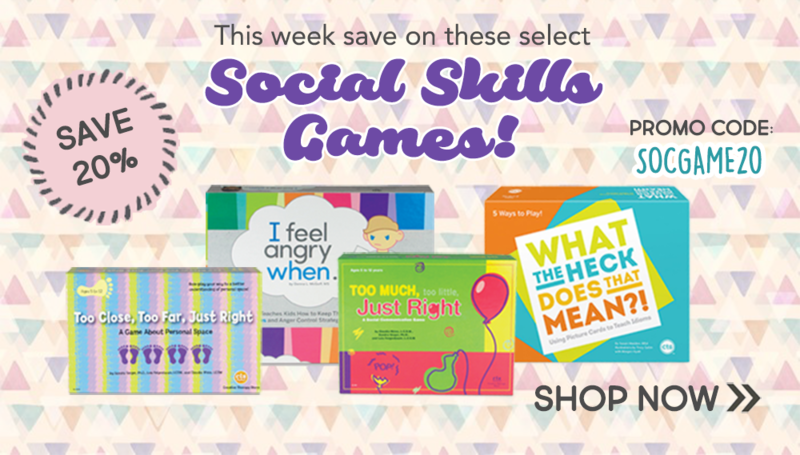 Pick of the Week: 20% Off Select Social Skills Games! Check out our last sale in November before Black Friday! This week only, take 20% off select social skills games with promo code SOCGAME20. Many kids, especially those with ADHD, autism or Asperger’s, have trouble comprehending the socially accepted physical boundaries that many take for granted. These games pictured above will help enhance social skills and make your child more comfortable in social settings. 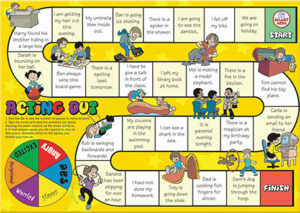 Pick of the Week: 20% Off Social Skills Games! Social skills are important for any developing child as they teach and reinforce important skills children need as they interact with their peers, family members and community helpers. Be sure to check out our featured game, a value set of six visually stimulating board games targets good social skills and behavior. The six games included in the set cover Morals, Manners, Empathy, Showing Emotions, Friendship, and Managing Emotions. Each game supports the development of social and emotional skills and the consolidation of those already learned. This set of board games provides a comprehensive approach to promoting the social and emotional skills that underpin effective learning, positive behavior, regular attendance, staff effectiveness, and the emotional health and well-being of students. This week only, you can save 20% on your purchase of select Social Skills Games by entering the Promo Code SOCGAME20 at checkout! Clue Cards teaches students how to interpret social situations, read facial expressions, and understand metaphorical forms of speech. This week, you can save 15%* on Clue Cards – just enter promo code CLUECARDS when you check out online! Play 5 different games to teach inferencing, faces and feelings, body language, exploring Wh- questions, and a variety of common idioms! Therapists, teachers and parents can uses the cards and games included in this set to help students perceive and understand the details of social presentation. Because the cards are flexible and adaptable, they can be used with both younger and older children, with mild or sever socioemotional difficulties. There are instructions for 5 different games along with 100 reward chips, targeted for players ages 6–16. Get a Clue: Players find “clues” in social situations and make inferences based on those clues (15 Social Situation Cards). Faces and Feelings: Link expressions with associated emotions (20 Feeling Cards, 20 Faces Cards). Body Language: Matching photos and captions, children explore body language for clues about thoughts and feelings (24 Photo Cards, 24 Caption Cards). The 5 W’s: Analyze 10 social scenes by asking “who-what-where-when-why” questions (10 Social Scene Cards, 1 Spinner). In Other Words: Learn the idioms and proverbs that often pop up in social conversation (30 Idiom Cards, 30 Idiom Definition Cards, 26 Proverb Cards, 26 Proverb Definition Cards). *Offer lasts through March 1, 2016 at 11:59 PM EST. 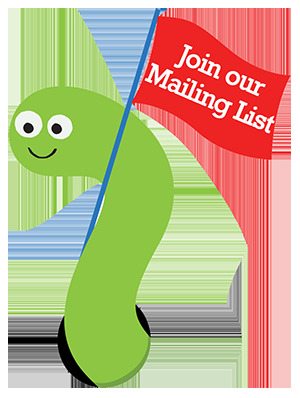 Be sure there are no spaces or dashes in your code CLUECARDS at check-out! Not valid on past purchases. This value set of six visually stimulating board games targets good social skills and behavior. The six social skills games included in the set cover Morals, Manners, Empathy, Showing Emotions, Friendship, and Managing Emotions. This week, you can take 15% off* your set of Social Skills: Set of 6 Board Games by using promo code SOCSKILLS at check-out! Each game supports the development of social and emotional skills and the consolidation of those already learned. This set of board games provides a comprehensive approach to promoting the social and emotional skills that underpin effective learning, positive behavior, regular attendance, staff effectiveness, and the emotional health and well-being of students. The set includes: 6 games made from durable cardboard measuring 16¼” x 11½”, 24 colored counters, 1 die, and 1 spinner. 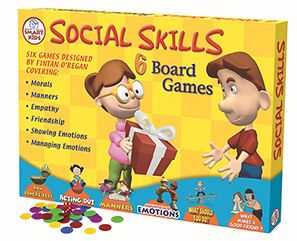 Don’t forget to use our promo code SOCSKILLS this week to save 15%* on Social Skills: Set of 6 Board Games! *Offer is valid until 11:59pm EST on April 21st, 2015. Not compatible with any other offers. Be sure there are no spaces or dashes in your code at check out! Pick of the Week: What Do You Say… What Do You Do… In the Community? What Do You Say… What Do You Do… In the Community? 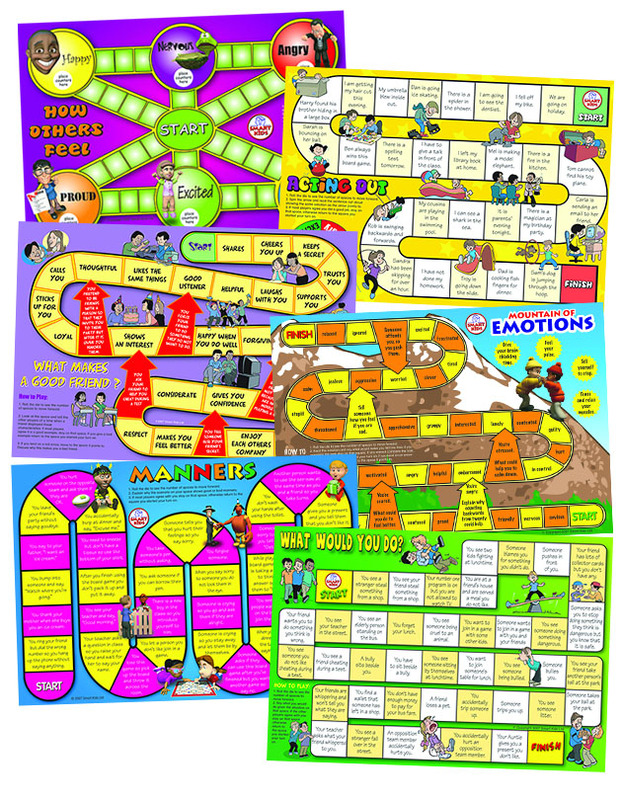 is our newly added interactive social skills board game that helps teach and reinforce important social skills children need as they interact with their peers, family members, and community helpers. The social questions in the game are ideal for improving reasoning, inferencing, as well as pragmatic, narrative, and conversational skills. This week only, you can save 15%* on your set of What Do You Say… What Do You Do… In the Community? by using promo code SAYDO at checkout! What Do You Say…What Do You Do… helps build social and decision-making skills appropriate for a variety of situations. Students move around the colorful community game board and answer social-skills questions. With each correct answer, they collect a token and try to fill a token strip. Students will visit places on the game board common to all communities: doctor’s office, police station, library, fire station, hospital, courthouse, city hall, park, grocery store, restaurants, and more. The Social Situation Cards target several different settings, and the open-ended questions encourage students to problem-solve and are excellent for role-play. The game includes a foldable 18″ x 18″ Game Board, 144 laminated cardboard Community Tokens, 390 color-coded Community Situation Cards, 6 laminated cardboard Community Characters, 6 Token Strips, and a 6-color Die. Don’t forget to take 15% off* your set of What Do You Say… What Do You Do… this week only by using promo SAYDO at checkout! I Feel Angry When… teaches children the important skills of learning how to express their anger in a nonthreatening way, and to respond in positive ways when they feel angry. This week, we’re giving you 15% off* your order of the I Feel Angry When… game by applying our promo code IFEEL at checkout! With this game, kids learn how to use I-Messages – a verbal template that offers a way to communicate how you feel and what you want without offending others. This method, when combined with basic anger control strategies, gives children an opportunity to express their anger in a calm way without resorting to aggression. As they respond to anger-provoking situations described on game cards, players learn how to use I-Messages to communicate their feelings. They also learn 12 anger control strategies that help them retain their composure in the moment anger erupts. Simple and straightforward, this game gives children the skills they need to keep their cool. The game comes with 2 Anger Control Spinners (one for ages 6–9 and one for 10–12), 1 I-Message Guide Cards, 200 Reward Chips, 54 Situation Cards, and 6 “Tell Me About It” Cards. This game is recommended for children ages 6 to 12. Don’t forget to use promo code IFEEL at checkout this week to save 15%* on your set of I Feel Angry When…! *Offer is valid until 11:59pm EST on November 25th, 2014. Not compatible with any other offers. Be sure there are no spaces or dashes in your code at check out! People communicate using not only words, but also tone of voice and body language. Many children, however, fail to notice these relatively subtle social cues in self-expression and personal space. 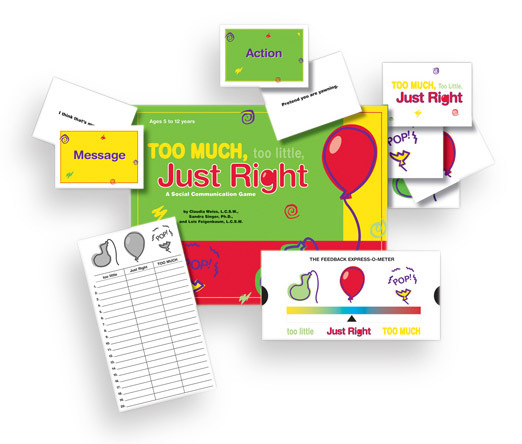 This week, we’re featuring two of our newest social skills games, Too Much, Too Little, Just Right and Too Close, Too Far, Just Right to help you teach your learners what is “just right” in social situations. Use our promo code JUSTRIGHT to save 15%* on your sets! Too Much, Too Little, Just Right teaches children to pay attention to tone of voice, observe body language, and note how these cues affect the message. Children assume two roles during game play: Messenger and Listener. They learn by observing others and by getting immediate feedback about their own expressive abilities. They learn to adjust volume, expression, gestures, and other physical cues in order to communicate effectively and achieve greater self-control, thus developing more appropriate and satisfying social relationships. Ideal for 2 to 8 players, this game can be easily used with larger groups or classrooms as well. Because it focuses on social interaction rather than on a game board, the game can be played virtually anywhere. Clearly focused and easy-to-use, Too Much, Too Little, Just Right is an outstanding tool for those working with children who have autism spectrum disorders. The game includes: 45 Too Much/Too Little/Just Right Cards, 90 Message Cards, 64 Action Cards, 50 Response Cards, 100 Reward Chips, and 1 Feedback Express-O-Meter. Recommended for children ages 5-12 years. Too Close, Too Far, Just Right teaches what’s “too close,” “too far,” or “just right” in social situations. Children take turns performing social scenarios described on the Role Play Cards, and then the instructor or group of students decides whether their proximity to each other is appropriate for the particular situation. The objective is to understand the concept the personal space. Focused and engaging, this game is a gentle way to help students with autism and ADHD grasp the idea of appropriate proximity and physical boundaries and thereby improve their relationships. The game includes 65 Role Play Cards, 24 color-coded Feedback Cards, 3 “Where do I stand?” Cards, 1 Footprint Mat, and 1 booklet with instructions, game preparations and play, and variations on game play with a large group or class. Recommended for children ages 5 and up. Don’t forget to save 15%* on your order of Too Much, Too Little, Just Right or Too Close, Too Far, Just Right this week by using promo code JUSTRIGHT when you check out online or over the phone with us! *Offer is valid until 11:59pm EDT on November 4th, 2014. Not compatible with any other offers. Be sure there are no spaces or dashes in your code at check out!